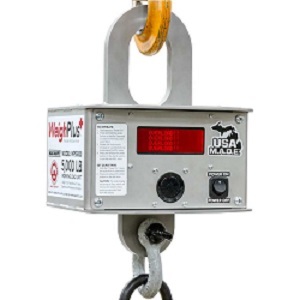 Industrial Magnetics, Inc. recently introduced the WeighPlus™ crane scale, a programmable device that warns the operator if they are lifting an overload, thereby protecting them from an unsafe lifting situation. Prior to lifting, the weigh scale’s working load limit (WLL) is set to match the rating on the lifting device being used, such as a magnet, sling, or chain. During the lift operation, the weigh scale’s LED displays the weight being lifted and will warn the operator if they exceed the WLL of their lifting device with a flashing red display. Available in a 5,000 lb. or 15,000 lb. weight capacity model, the scale contains a sensor with an accuracy of ±0.2% (0.002). The unit runs off of standard “D” batteries and has a power save setting that will put the crane scale into sleep mode when left on and not in use, increasing the operating life of the batteries. Housed in durable stainless steel, the electronics are shock mounted, while the recessed display and control area provide additional protection. View WeighPlus Crane Scales Page for more information.